This is one of the most important steps if you want to obtain a green, lush, and healthy lawn. This process will also make the roots more powerful and your lawn thicker. Fertilization also keeps weeds at bay, nurturing the soil and offering the plants’ roots the energy they need to grow and stay strong in adverse situations. Our Program consists of 6 rounds that will happen between six and eight weeks apart. Multiple weed treatments keep your lawn weed free all season. The program is not plant based, meaning we concentrate on soil fertility rather than the growth of the plant. The healthier the soil, the healthier the plant. Each round consists of a special blend of micro-nutrients, weed control, and slow release nitrogen to give the soil and plant exactly what it needs for the season. With N-Ext Level Turf you can be sure you are getting exactly what your lawn needs. As part of the program you will receive one on one consultations at your site to discuss any issues you might have. Yearly our turf care specialist will visit with you to make sure our program is meeting the needs of your lawn. With 6 visits per year our dedicated technicians will have there eyes on your property when it is needed most. This will insure your lawn stays healthy and weed free. Condray & Young has revolutionized lawn care by creating a subscription service. Our subscription service gives you equal payments, secure billing, no late payments, and easy no hassle service. Each month your card will be charged via a pay pal subscription. We have it all set up for you to easily sign up for our service. In less than five minutes you can have our entire lawn care program set up for the year. Starting at $30 per month you cannot go wrong with our program. Liquid Aeration is designed to break up and loosen topsoil and encourage deeper rooting to drive more oxygen into the topsoil profile. By utilizing key bio-stimulants and highly oxidizing material at key growth stages. Mechanical Aeration only addresses a small portion of the soil surface leaving 80% of the soil undisturbed. Driving roots deeper will crack the rest of the soil and with the aid of powerful oxygen adding ingredients, N-Ext Air-8™ will provide a dynamic shift in your soil. Early Spring application of crabgrass preventer, soil/plant stimulant, and slow release Nitrogen blend. Post Emergent Application: Stressed lawns can lead to grassy weeds taking advantage of areas of damaged lawns. With our post emergent application we can target specific grassy weeds that make lawns less attractive. Nutsedge: A grassy looking weed that can develop anywhere in the lawn. This weed has a yellow tint to it and can grow twice as fast as the turf. A special herbicide to target this weed will help to eliminate it from your lawn. Pulling this weed is not recommended, and will in fact make 2 more each time it is pulled. Biting Pest/Insect Application: From chiggers to ticks and mosquitoes, we can treat your lawn to make sure you are most comfortable after a day of enjoying it. Hardsurface Vegetation Control: Patios, sidewalks, parking lots; it seems as if a weed can grow anywhere. We offer services to remove these weeds and with extended control keep them from coming back. Overseeding: Typically done in the late Summer early Fall months, this service will fill in those bare spots. Aerating: Compaction of turf areas can result in lawns stressing during the hot Summer months. Aerating allows moisture and oxygen to reach the root system, along with reducing compaction. De-Thatching: Lawns can build up organic matter resulting in moisture and nutrients not being able to get to the root system where they are needed. De thatching will remove that layer helping the lawn to get all the necessary nutrients it needs to thrive. 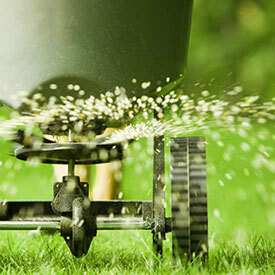 Seeding: Don’t have a lawn, we can help. We have all the proper equipment to install a new lawn. Sod: Instant lawn as we like to call it. Sod can be used for problem areas, or can be installed on new lawn areas. Lawn Renovation: Does your lawn look tired, is the lawn rough? Start over, grading and seeding or sod we can get your lawn back. If you are interested in any of our lawn care services you can fill out the estimate request form above, or just give us a call. We would love to give you a free quote on any of our services.